Cardiovascular disease (CVD) is the leading cause of death among women in the US, and African American women (AAW) have a disproportionately high rate of deaths from CVD. Physical inactivity plays a major role in CVD development. It has been reported that some rural women have low rates of physical activity; 39% of White women and 57% of women of color are reported to be physically inactive. Rural AAW have a high mortality and morbidity rate related to CVD and a high rate of physical inactivity. 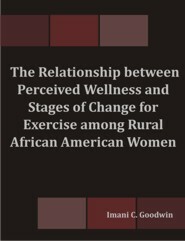 The purpose of this study was to describe rural AAW's perception of wellness in conjunction with their stage of change for engaging in exercise. A questionnaire was designed to obtain demographic information and reliable and valid questionnaires were used to measure perceived wellness and current stage of change for exercise. Using a descriptive, cross-sectional design, a convenience sample of 162 rural AAW was recruited from four rural churches in Selma, Alabama. A one-time meeting was conducted and questionnaires were completed by the participants. Statistical analyses including independent samples t-tests and one-way and two-way ANOVAs were conducted to determine if there were associations among demographic characteristics, self-reported presence of CVD, perceived wellness, and stage of change for exercise. Findings indicated that there was no relationship between perceived wellness and stages of change for exercise among rural AAW; no relationship was found between perceived wellness and CVD, or CVD and stage of change for exercise. However, 51.3% of the sample reported they were physically active, and 21.6% planned to increase their activity within 30 days. Annual household income and employment status were positively correlated with perceived wellness, suggesting a greater sense of wellness is related to income and employment among these rural AAW. These findings have implications for nursing practice in the areas of facilitating health promoting behaviors and development of exercise and wellness programs for rural AAW.